I can understand why corn was so popular a crop early on in the settlement of our country by Europeans. Sure, it tastes good popped, ground and cooked, and, while immature, fresh from the cob. Mostly, though, corn was easy to grow in the rough soil left from recently cleared forest. 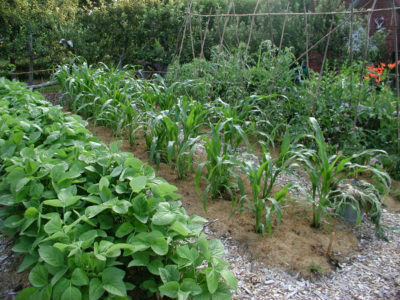 Most of my corn grows in my two vegetable gardens where the soil is crumbly and weed-free, watered gently by drip irrigation, and nourished annually with an inch depth of compost. The south garden is home, every year, to a couple of beds (about 60 square feet) of popcorn, and the north garden to 4 beds (about 215 square feet) of sweet corn. Those two gardens provide us with all the sweet corn and popcorn we eat for a year. Not to be an ingrate or a braggart, but the asparagus some friends recently brought over for our shared dinner didn’t compare with my home-grown asparagus. Not that the friends’ asparagus wasn’t good. Theirs came from a local farm, so I assume harvest was within the previous 24 hours. 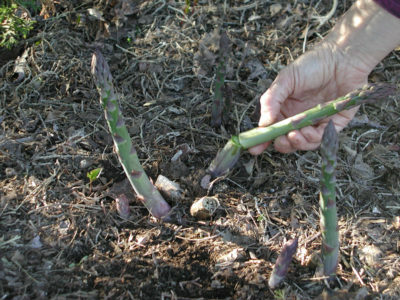 But the stalks of my asparagus are snapped off the plants within 100 feet of the kitchen door, clocking in at anywhere from a few minutes to an hour of time before they’re eaten. It’s not my green thumb that makes my asparagus taste so good. It’s the fact that I can harvest it within 100 feet of my kitchen door. The good king has gone to seed. Good King Henry, that is. A plant. But no matter about that going to seed. The leaves still taste good, steamed or boiled just like spinach. The taste similarity with spinach isn’t surprising because both plants are in the same botanical family, the Chenopodiaceae, or, more recently, the Amaranthaceae. Spinach and Good King Henry didn’t change families; their family was just taken in by, and made into a subfamily of, the Amaranthaceae. 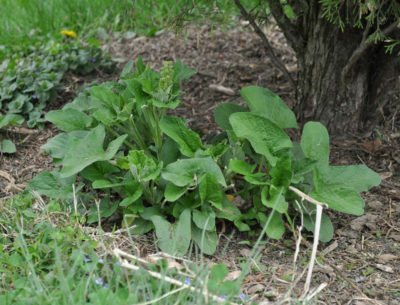 Whatever its name — and it’s also paraded under such common names as poor man’s asparagus and Lincolnshire spinach — Good King Henry is a vegetable that’s been eaten for hundreds of years, except hardly ever nowadays. While spinach, beet, and some of its other kin have been improved by breeding and selection over the years, Good King Henry was neglected. I’m no devotee of the perfect lawn, but I did recently suggest, for the bare palette of ground on which W wanted to plan for a variety of fruits, a patch of lawn. W protested that she hated mowing and wanted a “permaculture planting” that would take little care. Visitors to my garden have occasionally complimented me on my lawn. The only care I give it is mowing with a mulching mower that lets clippings rain back down. By not cutting the lawn I avoid “mining” the soil for nutrients by repeated harvest of clippings. The clippings also enrich the ground with humus. With blossoms spent on forsythias, lilacs, fruit trees, and clove currants, spring’s flamboyant flower show had subsided – or so I thought. 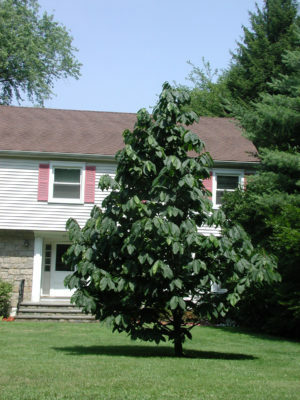 Pulling into my driveway, I was pleasantly startled by the profusion of orchid-like blossoms on the Chinese yellowhorn tree (Xanthoceras sorbifolium). 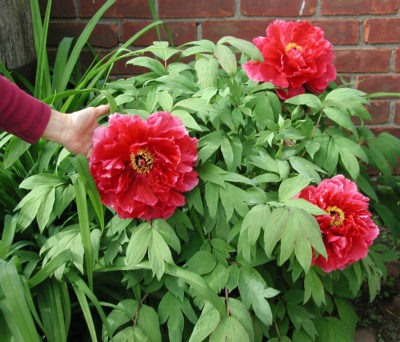 And I again let out an audible “Wow” as I stepped onto my terrace, when three fat, red blossoms, each the size of a dinner plate, stared back at me from my tree peony. Both plants originate in Asia. Both plants are easy to grow. Both plants have an unfortunate short bloom period, more or less depending on the weather. Fortunately, both plants also are attractive, though more sedately, even after their blossoms fade.